Valentine’s Day is well over by now, but many grocery stores are still selling off their overstock seasonal candy at an awesomely discounted price. In our local supermarket, for example, Valentine’s chocolates and all kinds of candies in pink, white, and red are going for 50% to 70% off even though it’s all still delicious and perfectly good! Every year, the post Valentine’s Day sales inspire us to do one thing: stock up on sale treats of all different kinds and make ourselves some delicious homemade desserts. Check out these 15 absolutely delicious recipes that use up all kinds of leftover Valentine’s Day treats! You might not make yours quite as obviously festive as these ones, but we guarantee you’ll still be practically drooling by the end of the post. Did you take a walk down the baking section at Walmart and come out with all kinds of novelty shaped sprinkles and cake toppers even though they’re not exactly seasonal anymore? Never fear! 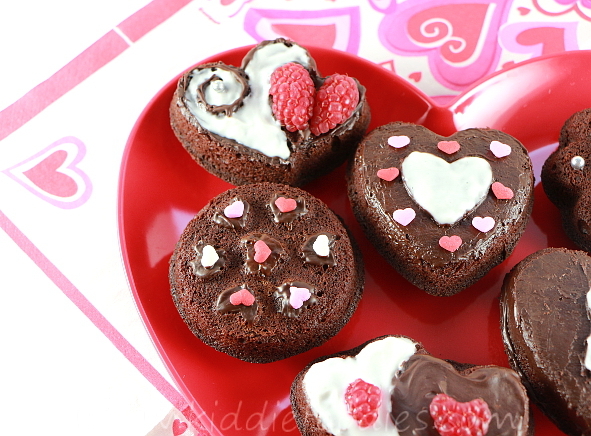 Kiddiefoodies is here to remind you that heart shaped cupcakes and brownie bites are never a bad thing. After all, you don’t need an excuse to tell your kids or your partner that you love them, right? Top those yummy little cakes with those discount sprinkles no matter what month it is! Are you celebrating Valentine’s Day a little bit late this year because you and your partner have a long distance relationship and this is the first time you’ll be seeing each other since before the holiday? Then you’re in serious luck with all of those discount candy prices! 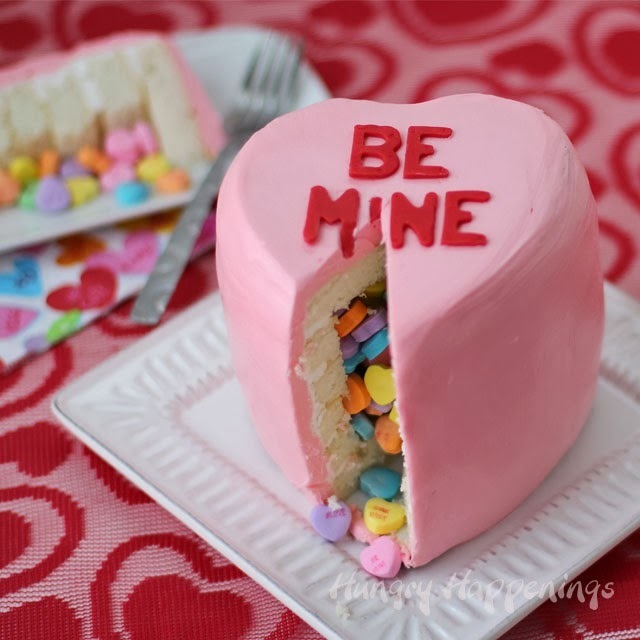 Make them something really unique and impressive to use up those hilarious sugary conversation hearts, like this cake from Hungry Happenings that has a cool candy surprise in the middle. 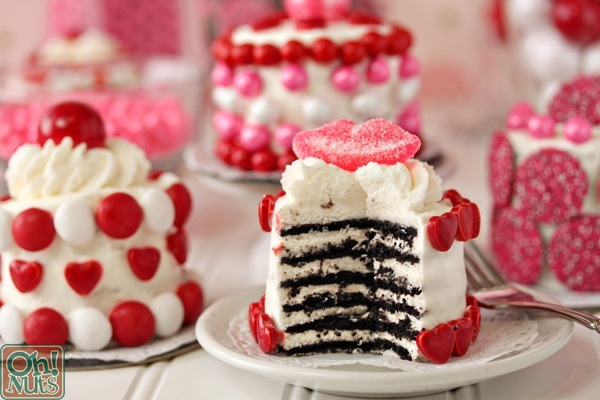 Do you have a small quantity of funny Valentine’s Day candies but not enough to decorate an entire cake with? Then try making adorable little mini cakes instead, just like Oh Nuts did here! Of course, you could make these any time of the year, but there’s nothing wrong with a silly set of gummy lips on top of a nice dessert for a loved one even though it’s almost March. There are so many candies and chocolates that come in novelty Valentine’s Day colours around this time of year, and we’re always very pleased about it. After all, there’s nothing wrong with a little bit of bright treat decor, no matter the season! 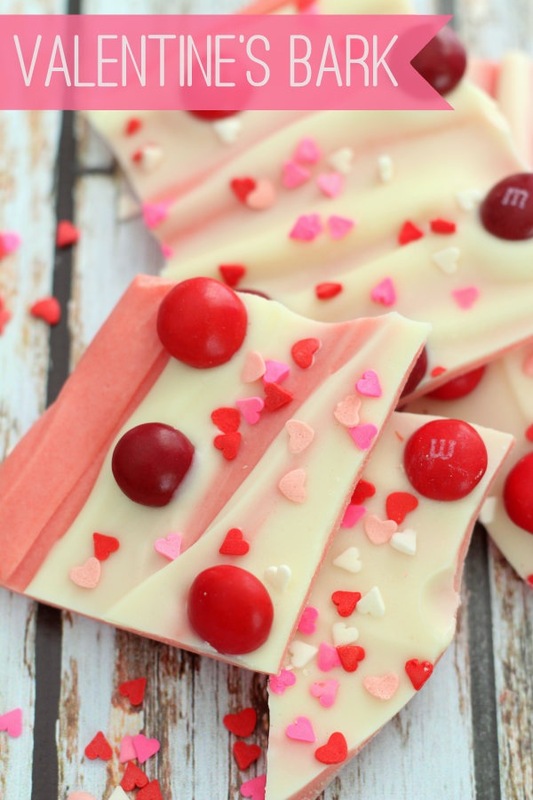 Lil’ Luna shows you how to make a deliciously sweet white chocolate and strawberry bark and with adore the idea of topping it with red M&M’s to complement the flavour and colour scheme, even if it’s not the “season of love” anymore. It just plain looks cute! Does your child have a birthday that’s right near Valentine’s Day, but just a little bit afterwards? Then you can hit the discount candy jackpot every year! 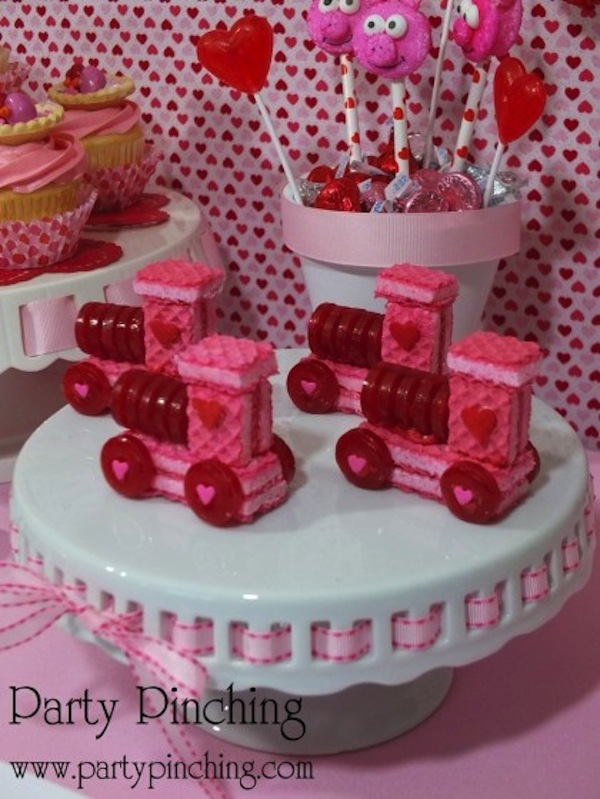 You might not theme your party treats with hearts like this design did, but making these little wafer cookie choo-choo trains like Party Pinching did here is still an awesome idea for a kids’ party. 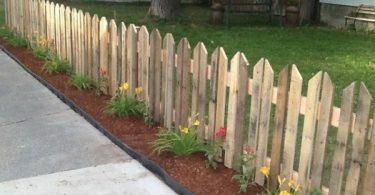 You could even have them help out so that you get a snack and a party activity all in one! 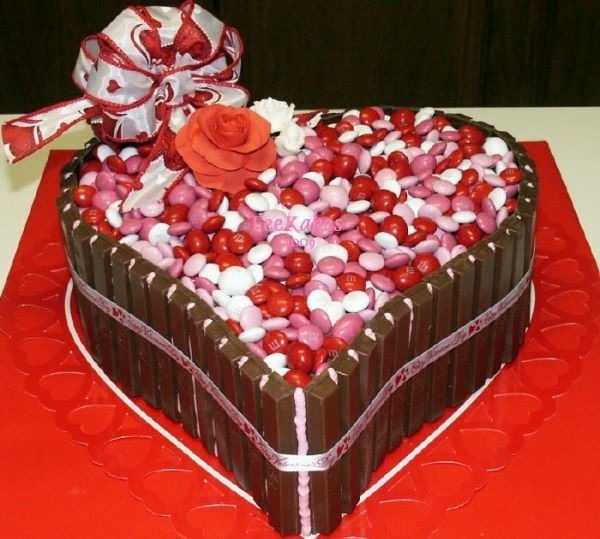 You don’t necessarily have to make your cake in the shape of a heart like this one, since Valentine’s Day is, in fact, over for the year, but the concept is still one that perfectly uses your discount candy and looks totally awesome no matter what shape you choose! We have confidence that you’ll be able to find both Kit Kat bars and M&M’s on sale right around this time, just like Taste of Home did here. Did you pick up some heart shaped sprinkles but your loved ones aren’t really huge fans of cake based treats like cupcakes or brownies? 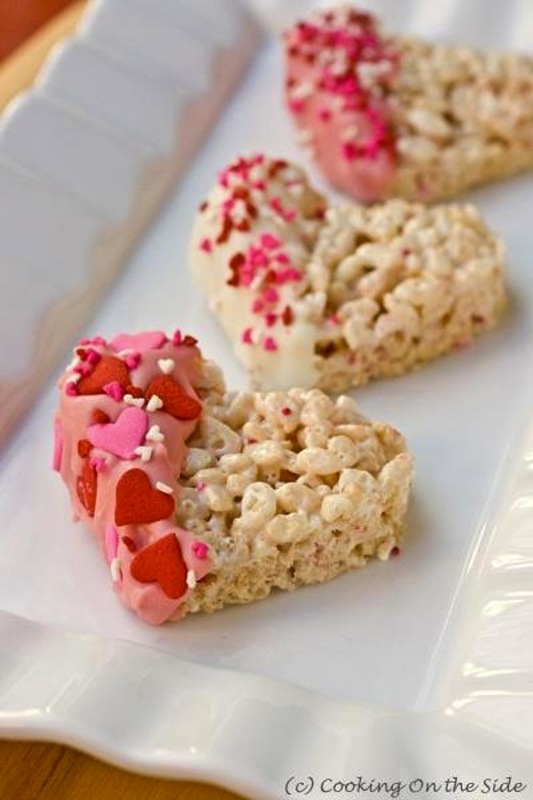 Try making them Rice Krispy treats instead! You might not shape yours like hearts the way It’s Written on The Walls did, since that’s pretty seasonal, but covering part of each treat in chocolate and sprinkling it, no matter what shape of sprinkle you’re using, is a delicious idea any time of year. Did you pick up so many discounted conversation hearts that you couldn’t have possibly fit them all in the middle of a cake the way we showed you above? 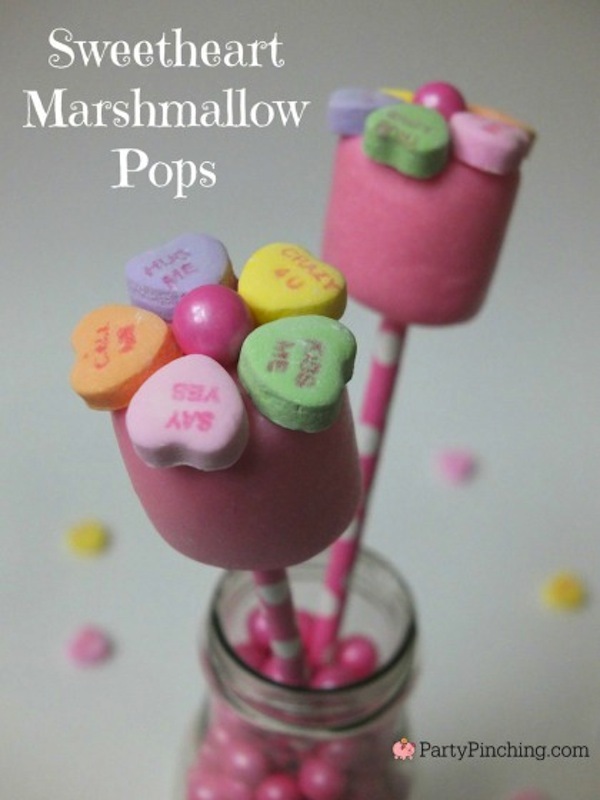 Then try making these hilarious little marshmallow pops too! Sure, these ones look pretty seasonal, but we like the idea of expressing your love for the people around you any time of year (and, if we’re being honest, we’re always down for a little extra sugar). 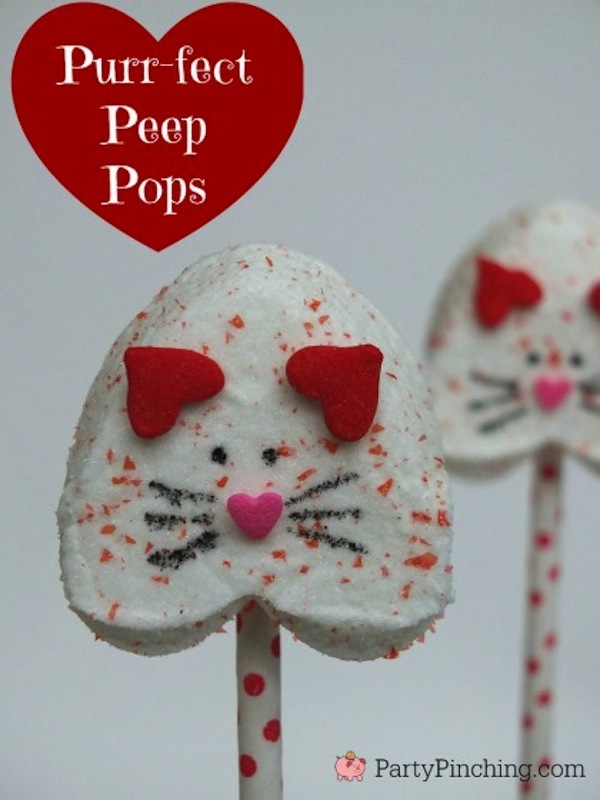 Party Pinching shows you how these cheerful pops are made! 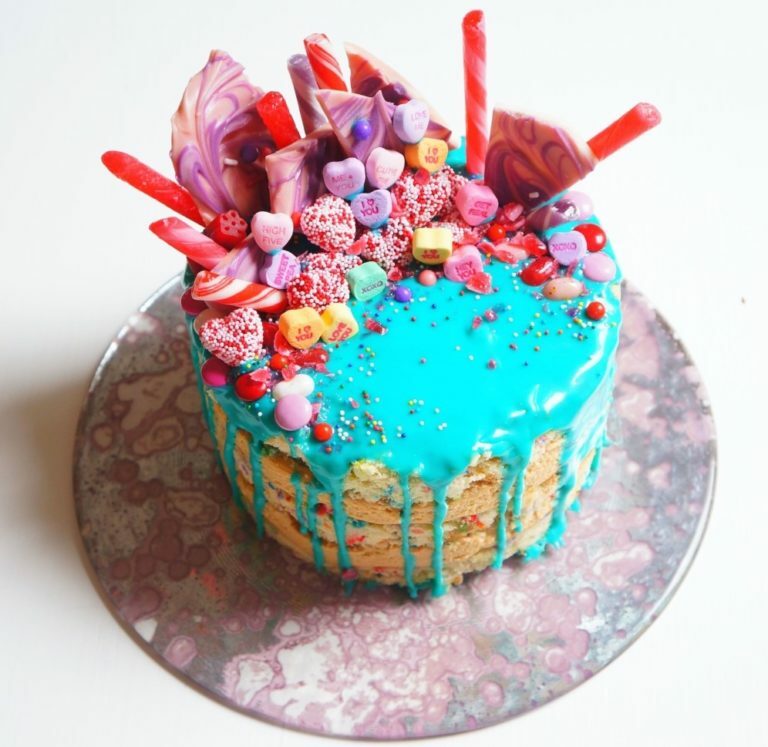 Were you feeling the mini cakes idea we talked about above but you’re not sure that gummy candies and cake really go together? Try using gumdrops or sugar candies instead! This is the kind of recipe that our kids would go crazy for because it combines more than one very sweet thing and we know they won’t care what shape or colour of candy we use, so we might as well get it on discount. Check the idea out on Oh Nuts! 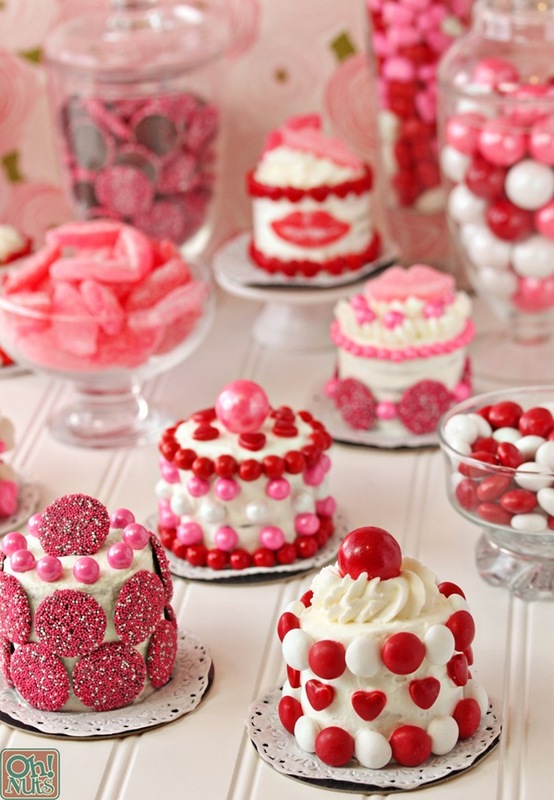 Valentine’s Day isn’t the only time of year that icing in red or white shades is useful! 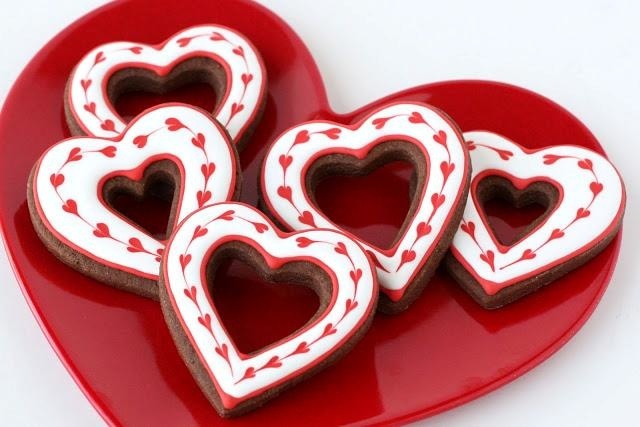 We’ve given you a heart shaped suggestion here because we’ve actually tried these unique cookies from Glorious Treats and we very much enjoyed both shaping and icing them this way, but you could make just about any iced baked good using white and red. Are your kids absolutely crazy about marshmallows no matter what kind of year it is? Well, those are definitely on sale in stores right now too! They might be mostly shaped like hearts, but don’t let that stop you. Party Pinching suggests flipping the hearts upside down on little kebab or lollipop sticks and decorating them to look like cute kitty cats instead. Have you always been a big fan of treats that combine sweet and salty flavours? Then grab some yummy pretzel sticks and check out the discount post-Valentine’s Day section for some sugary chewy candies! 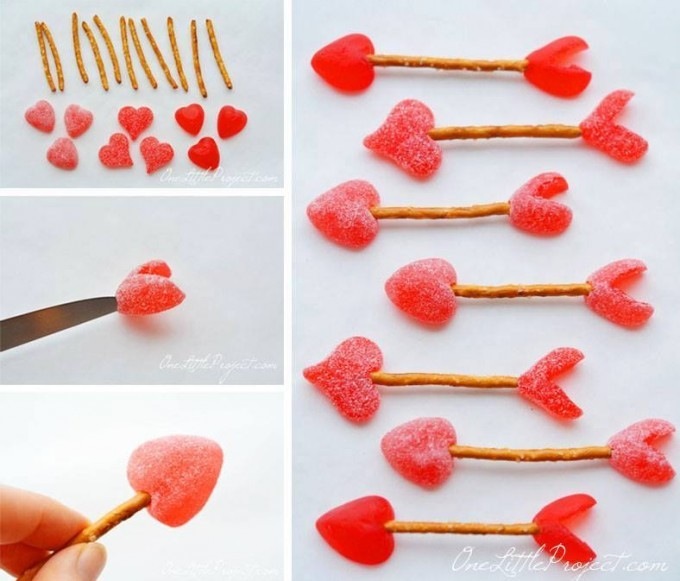 Heart shaped treats are awesome for making funny little arrows with your kids, but you could create all kinds of shapes using the same method as One Little Project. Maybe you like sweet and salty snacks but it’s the pretzels that you’re getting in the seasonal discounts? Well, we don’t see anything wrong with giving your kids some heart shaped snacks to make them feel appreciated! 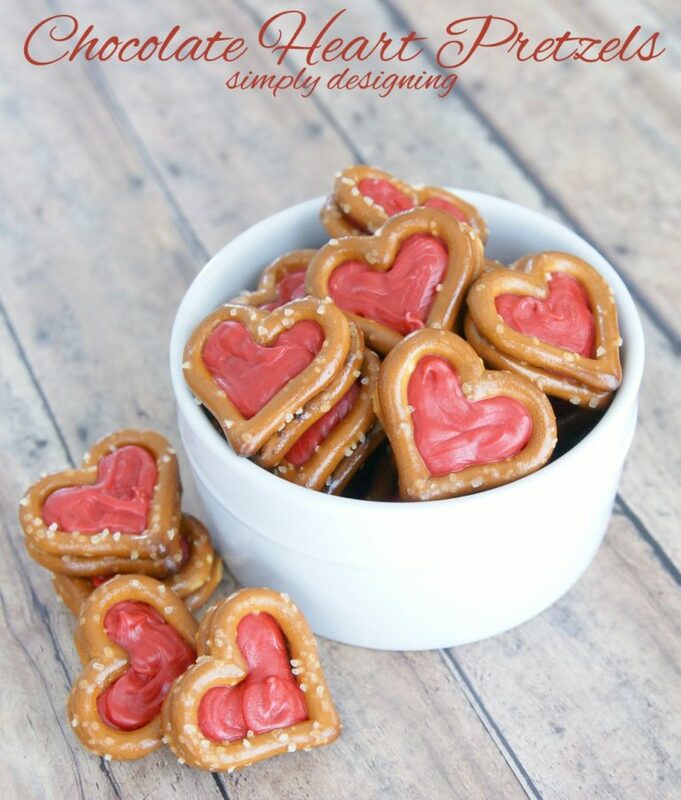 Check out how Simply Designing little sweet and salty sandwiches in a way that will use up your discount Valentine’s icing too! Did you get lucky with a whole pack of discount wafer cookies right after Valentine’s Day but your kids aren’t really into trains enough to get you trying the idea we included above? Then try something a little simpler instead! No matter what kind of icing or what shape or sprinkles you’ve got, making these adorable dipped cookies will be lots of fun. Get the full details on Family Fresh Meals. Did you get a little bit carried away in the discount Valentine’s Candy section this year and now you’re overwhelmed and don’t know what to do with it all? 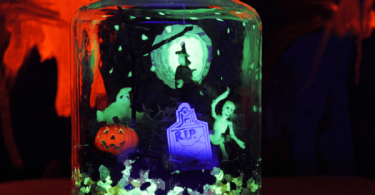 Well, here’s an idea that’s sure to keep you and your kids amused both in making it and in eating it! Check out how Eat Make Celebrate created a layered cake that’s basically a sweet, eye-catching free-for-all. Do you know someone who loves nothing more than taking a trip down the discount candy aisle at the supermarket at the end of February? 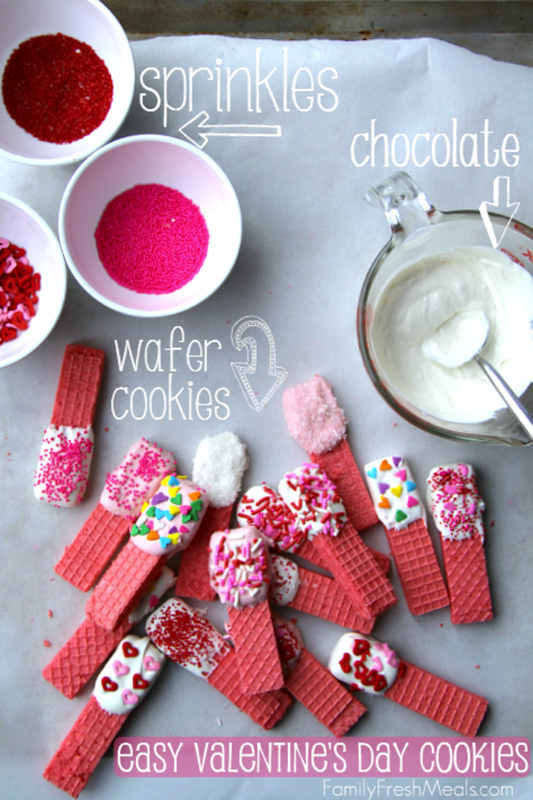 Share this post with them to give them a little bit of post-Valentine’s Day treat inspiration!